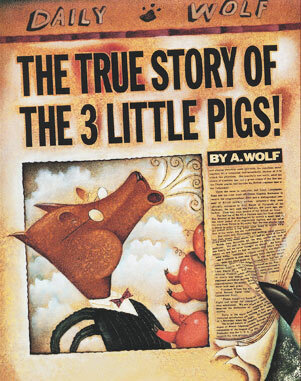 Based on the hilariously popular book, the play begins where the book leaves off, with Alexander T. Wolf on trial for the murder of two of the three little pigs. Fast-talking independent reporter pig, Lillian Magill, claims nobody has ever heard the Wolf’s side of the story, and she is hungry for the truth. The Honorable Prudence Pig, a tough as nails judge with a weakness for musical theater presides over the case. 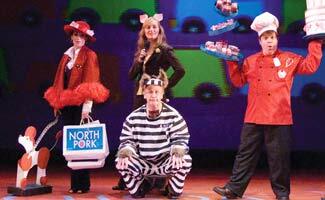 A sharp, smooth-talking lawyer pig named Julia is the prosecuting attorney, and she always gets her way. Al is a soulful charmer with a love of gourmet cooking and the fine arts. He takes the stand in his own defense, but it looks as though the piggy world is against him. After all, he is a carnivore to the core, but is he also the victim of a media frame-up? Will Magill get her journalistic glory? GUILTY or NOT GUILTY? When all the witness statements are in, the audience piglets become the jury and determine Al’s fate! Are YOU afraid of the Big, Bad Wolf? What really happened? YOU decide! For more information view our online interactive brochure. This production will be most enjoyed by ages 5 through Adult, or grades K—5th grade. Most enjoyed by ages 5 through Adult, or grades K—5th grade. Promotional and technical materials will be posted as they become available.